Human SLAMF1 (SL1-H52H0) is expressed from human 293 cells (HEK293). It contains AA Ala 21 - Pro 237 (Accession # Q13291-1). The protein has a calculated MW of 26.2 kDa. The protein migrates as 42-60 kDa under reducing (R) condition (SDS-PAGE) due to glycosylation. 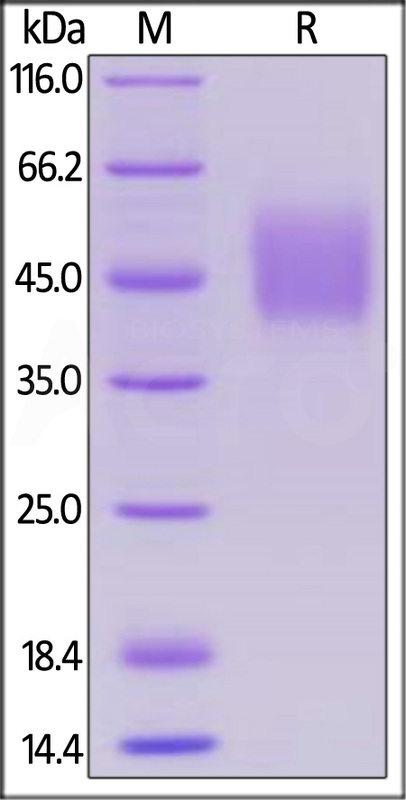 Human SLAMF1 on SDS-PAGE under reducing (R) condition. The gel was stained overnight with Coomassie Blue. The purity of the protein is greater than 95%. Self-ligand receptor of the signaling lymphocytic activation molecule (SLAM) family, also known as CD150, is the prototypic member of the SLAM subfamily of the CD2 protein family.SLAM receptors triggered by homo- or heterotypic cell-cell interactions are modulating the activation and differentiation of a wide variety of immune cells and thus are involved in the regulation and interconnection of both innate and adaptive immune response. Activities are controlled by presence or absence of small cytoplasmic adapter proteins, SH2D1A/SAP and/or SH2D1B/EAT-2. SLAMF1-induced signal-transduction events in T-lymphocytes are different from those in B-cells. The type I transmembrane glycoprotein Signaling Lymphocytic Activation Molecule (SLAM). (1) Cannons JLt, et al., 2011, Annu Rev Immunol., 29, 665-705. (2) Jordan MA, et al., 2011, J Immunol., 186(7), 3953-65. (3) Berger SB, et al., 2010, Nat Immunol., 11(10), 920-7.